This module will explain the construction accounting terminology and provide an overview of the unique aspects of revenue recognition in the construction industry, the different methods of recognizing revenue, the methods used to calculate POC and earned revenue, how the POC and earned revenue details flow to the work-in-progress schedule, the impact of over/underbilling on financial statements, and the impact of change orders and claims on revenue recognition. This module will provide an overview of the underlying theories that govern good Cash Management, the value of Cash Flow Management, the use of tools available for good Cash Management, the significance of using Cash Management internal controls, and methods of implementing sound Cash Management techniques. This module will provide an overview of the project life cycle from opportunity identification to project closeout phase, the documents that relate to the contract, the collaboration between project and finance teams to minimize the associated risks, the relevance of job start-up meetings that ease administration and boost profits, the importance of managers’ involvement and communication throughout the project, and the project closeout process. This module will provide an overview of the relevance of risk management in the construction industry, the various insurance products and their application, risk management as part of the contract administration process from beginning to end of a project, the methods to effectively interface with both internal and external partners to make risk management a competitive edge for your company, and the life cycle of a company’s strategic risk management, project risk management, and insurance program management. This module will provide an overview of the purpose and importance of contracts, the types of contracts typically found in the construction industry, the different contract clauses and the contract clauses that can create problems, efficient use of legal assistance, and the different methods of Alternative Dispute Resolution. This module will explain how WIP schedule is a critical supporting schedule to the income statement and is a dynamic business tool. It will also provide an overview of the key users of the WIP schedule and the significance of the WIP information, the importance of the job cost system, the role of the formal cost review process in the outcome of the WIP, the importance of successful change order management to project profitability, and the impact of poor forecasts. The estimated seat time to complete all the modules is a minimum of six hours but could be more depending on the pace of the learner. 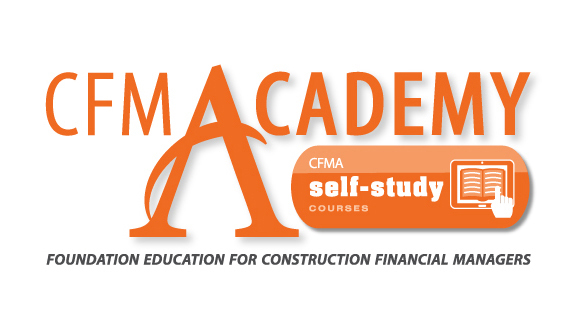 The CFM Academy is an online self-study course that was developed for construction financial professionals with zero to three years' experience in the industry. No prerequisites or advanced preparation required. CPE credits are not awarded for completing this course. Participants who score 100% on the final exam will receive a Certificate of Completion.